Punish those trouble makers ! Was soma thero's death due to natural causes? His book "Buddha Stupa", to which he was to receive the so called doctorate, was translated neither to English nor to Russian. The Rector (Shanti P. Jayasekara) only can understand Sinhalese, But he can't nominate a person for doctorate by himself. It should come from a senate. Soma Thero had called his brother and Dharmayathanaya. But none knew about the heart ailment until he has passed away. 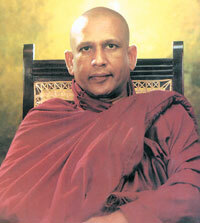 His (Shanti P. Jayasekara) younget brother Sisil Jayasekara says that he doesn't know his brother is a Catholic Priest. And he says he knows only he is a Engineer who works there. He says if he knows this previously he won�t let him to go Russia . Sisil Jayasekara was the former editor of �Aratuwa� paper which is published by Ceyilnco Group. Thero had got a heart attack in the air craft (say so) and he was taken to st.petersberg city hospital 2, which was 800 km away from Moscow air port. Once insulin overdosed it causes instant heart attack. Because it will make blood more thicker. Family members and close friends denies that he had heart attack. Thero was intended to return to sri lanka in 10 days, but he had stayed there for more than two months and he had telephoned sri lanka only thrice during that period. It took 07 days for the Thero's body to be sent to sri lanka . Ven. Gangodavila soma Thero was the ONLY Buddhist Thero who preached without any fear or hesitation against the orthodox forms of religions criticized the behaviour of politicians.